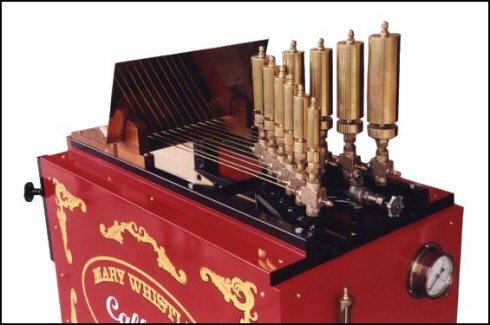 A calliope is a musical instrument that produces sound by sending steam through whistles, originally locomotive whistles. Joshua C. Stoddard of Worcester, Massachusetts invented the calliope, patented October 9, 1855. The calliope is also known as a "steam organ" or "steam piano." It was often played on riverboats and in circuses, where it was sometimes mounted on a carved, painted and gilded horse-drawn wagon in a circus parade. Stoddard's original calliope was attached to a metal roller set with pins in the manner familiar to Stoddard from the contemporary clockwork music box. The pins on the roller opened valves and blew the whistles. Later, Stoddard replaced the cylinder with a keyboard, so that the calliope could be played like an organ.